Personal Demeanour – Pious – Cherishes faith in the Emperor of Mankind and my Primarch Roboult Guilliam above all else. Chapter Demeanor – Honour the Codex – Slow to anger and rarely makes rash desisions. Facilitator and Peacemaker. 400 Command, 400 Charm, 400 Invocation trained, 750 Long Range Telepathy, 500 Astropathy, 500 Mind Scan, 400 Rite Of Sanctioning, 200 Forbidden Lore Adaptus Astartes (Extensive Knowlage of Chapters and thier rituals), 400 Forbidden Lore Deamonology, 500 Psy Rating 4, 500 Avenger, 750 Elite Advance from Rouge trader Telekinesis School. 100 Advanced Telekinesis. Raised on the world of Calth, Uriel was raised on an underground farm and worked upon the land since the day he was able to walk. At the the age of six, Urial was recruited by the Ultramarines and trained at the Agiselus Barracks on Macragge where it is said that the Great Roboute Guilliman himself trained. 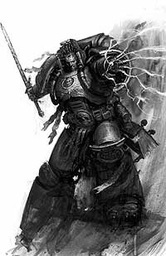 Scrutinised by Librarians for psychic ability, Urial was selected to join the Chapter Librarium and there trained under the best, Varro Tigurius thought to be the strongest psycher in the imperium. Urial quickly graduated and just in time to serve with the Forth Company at Tagris Ultra here it was found that he had an aptitude for fighting the Xenos threat, it was on Tagris Ultra that the Fourth Company fought alongside the Deathwatch for the first time in nearly six centuries. After a hard won victory against the Hive Fleet, Captain Ventris Suggested that he serve with the Deathwatch as Ventris himself had done many years before. “In the name of the Primarch and by the will of the Emperor you will DIE! Who would choose this fate, that of endless war, of death and blood on countless worlds. The threats of the warp and of the Archenemy, xenos and the fallen, foes beyond imagination. Someone must choose this life, of certain death! I would, I did and I would do so again a thousand times over. Like a hundred thousand others before me since time immemorial… I am an Ultramarine.